Many people lament about how unproductive the traditional “business meeting” is. One or more participants feel the need to assert their opinion at great length, or simply regurgitate the same information multiple times. Most of us sit passively through these time-wasting meetings because … well … I don’t know! But now you can have the facts on your side when you want to remind people that any particular meeting is wasting time. 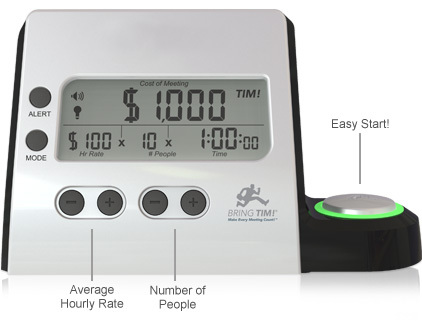 Just Bring TIM, the “Time is Money” meeting cost calculator and clock! Simply saunter (or swagger, if you prefer) into your next business meeting with TIM in your hand. Plop TIM down on the table, and press the plus or minus button to set the average hourly rate of all of the meeting’s attendees. Press the other plus or minus buttons to set the number of people attending the meeting. As soon as the meeting is called to order, press the big button on TIM’s side. Then sit back and watch the dollars tick past! TIM will automatically calculate how much money has been spent in terms of salary dollars for every minute the meeting lasts. Meetings can be paused — say for a potty break — by pressing the big button again. When the meeting resumes, press the big button and the clock picks up where it left off. TIM also offers an audible and visual fifteen minute reminder, to help you make sure your meetings don’t run on too long. The audible portion is a very simple, unobtrusive beep, and the visual portion is simply a ring of light around the big button. Neither one is particularly strong, so you might actually need to be paying attention to TIM to notice them. And when you’re not in meetings, you can use TIM as a regular desk clock. In all honesty, I don’t think bringing TIM to any meeting is going to win you any popularity contests. It might help keep your meetings shorter, but that doesn’t necessarily mean that they’ll be more productive. Certainly one can hope; but TIM might just result in more shorter meetings. TIM might be nice for freelancers or contractors who have a hard time keeping track of billable hours, especially on long conference calls. Simply start the clock running when you join the conference call, and you’ll know that you’re billing hours just for listening to everyone else ramble on! It’s only $25 at BringTIM.com. That small investment might well save a lot of wasted salary dollars. One lucky reader (in the U.S. only, sorry) can have their very own TIM for free! Just comment below, and I’ll pick a random winner later today!